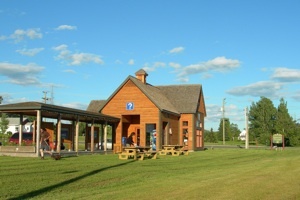 Situated near Routes 132 and 299, leading to the Gaspésie National Park, New Richmond tourist office offers various services to meet the needs of tourists. The staff will serve you with pleasure and warm in its modern and friendly tourist welcome bureau. You will find all the documentation and materials needed to facilitate your stay. An essential stop during your stay in the Chaleurs Bay! Services: Help for booking accommodation, restaurants and activities, reading corner, restaurant menus for consultation, changing tables, vending machine. May 28 to June 17, 2018: 9 a.m. to 4 p.m.
June 18 to 22, 2018: 9 a.m. to 5 p.m.
June 23 to August 12, 2018: 8:30 a.m. to 7:30 p.m.
August 13 to 19, 2018: 8:30 to 7 p.m.
August 20 to September 2, 2018: 9 a.m. to 6 p.m.
September 3 to 16, 2018: 9 a.m. to 4 p.m.